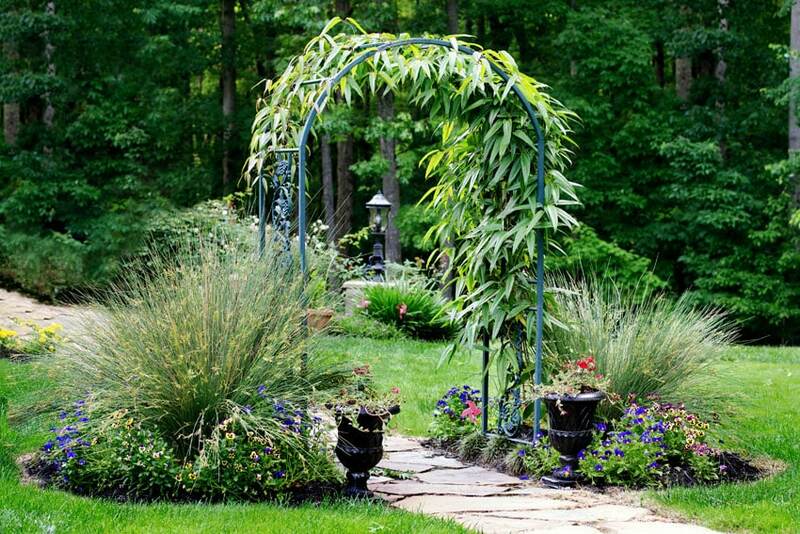 Welcome to our gallery of beautiful arbor designs to help inspire and provide ideas for your own garden. Gardens are always a welcome addition to any home, as they help improve the ambiance, air quality, and beauty of the space surrounding them. A well designed garden can help increase the property value and allow you to better enjoy your home’s outdoor living spaces. Below we’ll explore a variety of garden arbor designs and share creative ways to add one to your own backyard. Garden arbors has been around for centuries, originating from Italy, and has always been a favored fixture in gardens of any size and style. They give both aesthetic and functional improvement to any garden space, and blend into the existing landscape design. They are easy to install and can be bought ready-made, and can also be a great DIY project. Perfect for large gardens, the massive archway arbor in the picture above forms a tunnel leading to the other end of the garden area. The wide structure of the arbor is made out of tubular metal pipes which were bent to create a Moroccan style arch. 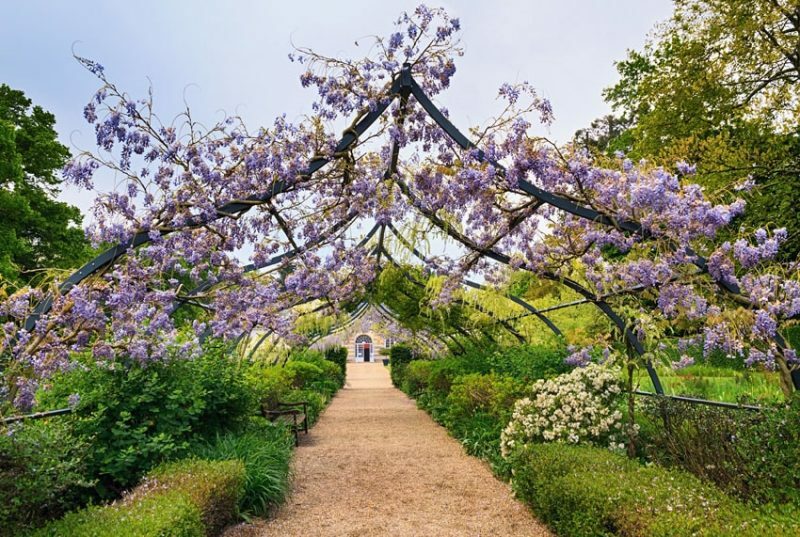 Growing along its sides and on the arbor itself are a variety of shrubs, and gorgeous wisteria vines. Archway Arbor – this is the most common type of arbor available in a wide variety of materials. As the name suggests, it forms an arch, and is commonly used to create a tunnel, dividing large lawns, allowing you to create a clean break in between a variety of plants and shrubs on either side. Archway arbor tunnels also make a great addition to existing pathways, adding a bit of shade to the pathway while also giving it a romantic appeal. Traditional Arbor – Often used as a garden gate or entrance, this type of arbor has a flat roof/top and trellis on the sides in which the plants/vines crawl onto. Some traditional arbor designs have built-in bench/seat, making it a perfect spot to relax on. Gable Arbor – this type of arbor is characterized by its sharp, pitched ‘roof’, giving it a more angular profile compared to archway arbors. This also comes in a variety of designs and materials on the market. Once you determine the type of arbor most suitable for your garden, you also have to consider the material for the arbor among the vast variety available in the market. For a more traditional feel, wood could be the perfect material, but is unfortunately more prone to weathering than the other materials. Using metal is also an option, especially if you want to create flowing curves, as the metal is more pliable. Depending on the type of metal used, it is more weather resistant than most wood materials, but can still be subject to weathering and rust, so repainting would be required. Another material to consider for your garden arbor would be plastic or vinyl. This materials is the most lightweight option, making it a perfect choice of you’re the type who likes to rearrange the garden once in a while or when weather changes. This material is also the most weather resistant and low-maintenance. Depending on the type of plastic material used, it can serve you for many years, but can also be prone to cracking or degeneration from constant temperature changes/sun exposure. There are many types of climbing plants you can use for your arbors and pergolas. You should always consider the structural capacity of your arbor or pergola before deciding on a plant, as some of them are heavier than the others and may destroy your arbor structure. This is another wooden archway arbor which was connected to a picket fence to serve as a gate/entrance area. It is made of solid wood painted in white, and has a neo-classic design. 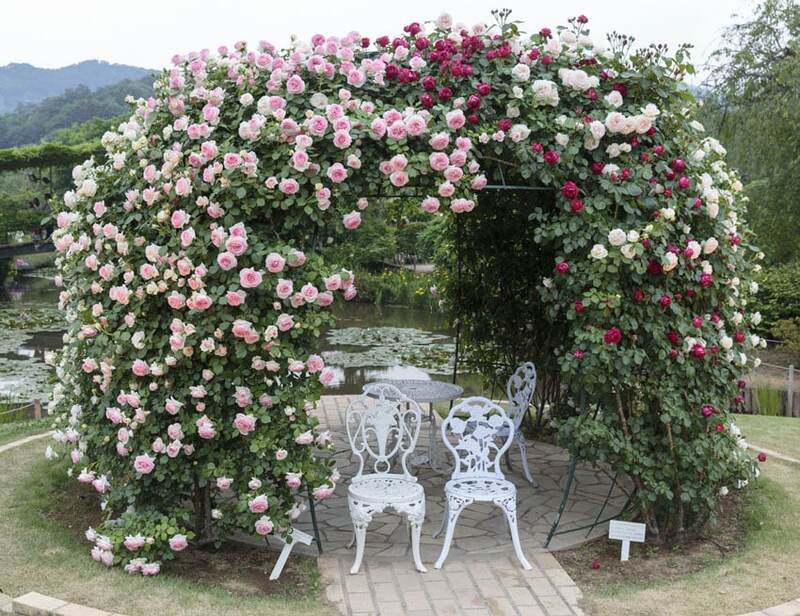 It has no trellis on is sides, but has one on its top arch where gorgeous pink roses grow. 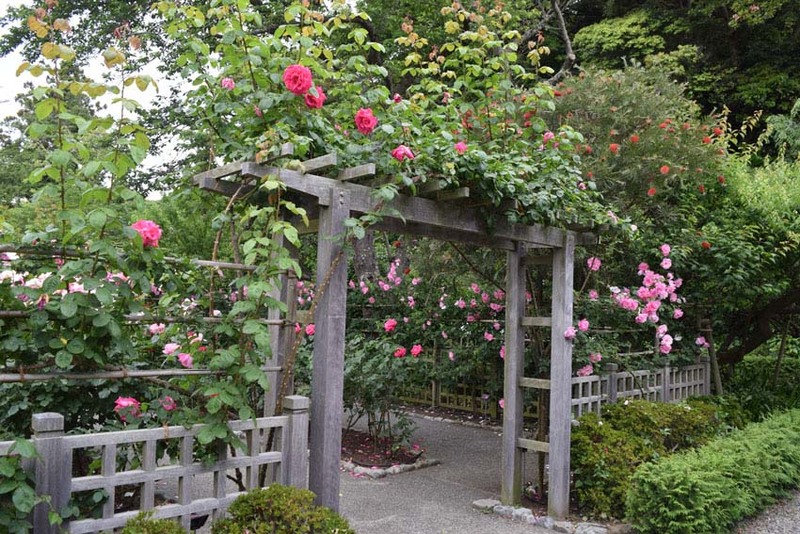 Roses – the climbing variety of roses is a classic choice for arbors and pergolas, as it gives a romantic and tranquil atmosphere. Aside from the above-listed plants, there are many other types of vines/plants you can grow on your arbor. Important factors to consider when choosing the right type of plant would be climate, arbor material/strength, rate of growth, maintenance, as well as color/look. 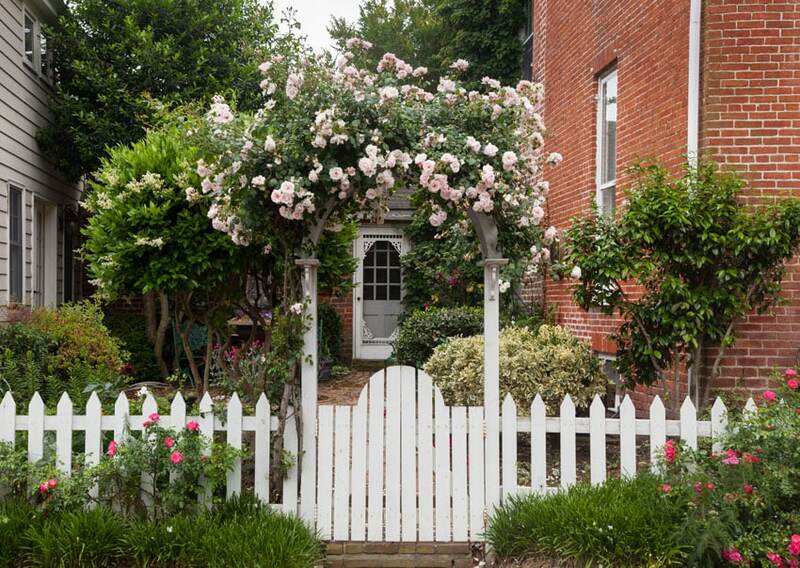 Below are some gorgeous examples of garden arbors for your inspiration. 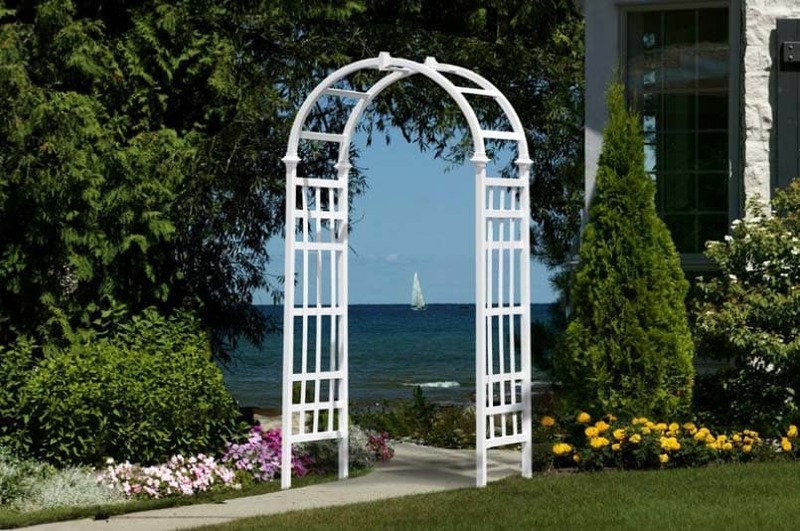 This beautiful archway arbor is made of weather-treated wood painted in white. This small arbor is used as a gate/entrance to the garden area, and has trellis on its sides where crawling plants/vines could grow on. A wood archway arbor painted in white and attached to a picket-fence gate leading to the entrance of the house. The small arbor has some cross vines growing on it, adding a bright pop of red to the arbor. 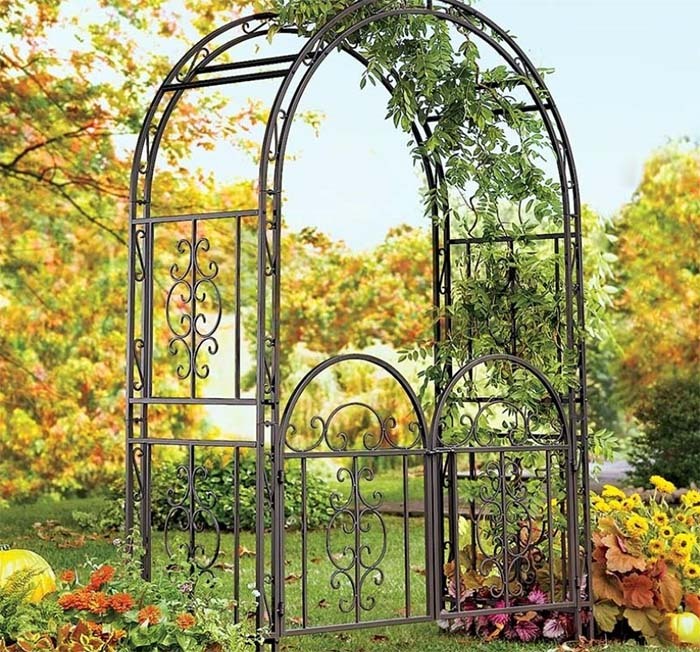 This metal arbor would be a great addition to any garden. It has a classic archway shape and a built-in gate door. You can conveniently place this in between well-grown shrubs to act as a gate/entrance door. Decorative bent metal fleurs give this arbor a classic, art-nouveau feel, reminiscent of gorgeous English gardens. This large archway arbor made from metal was used as a center-piece for the garden’s large pond area. 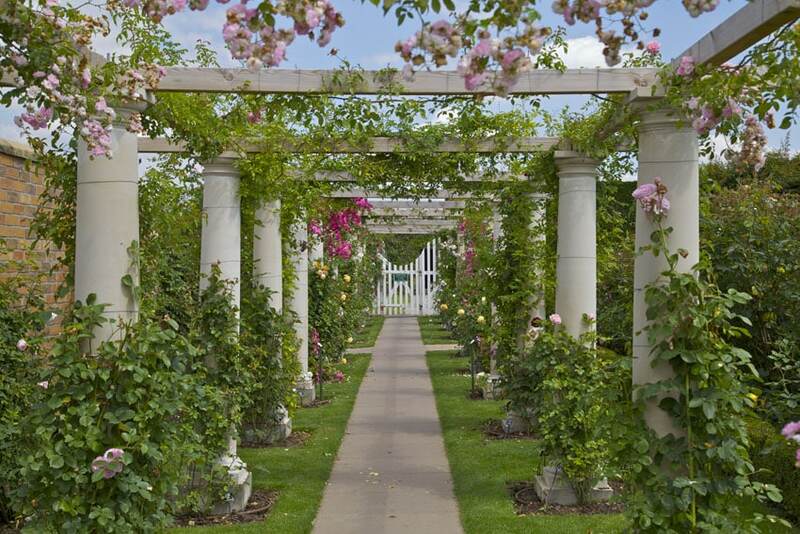 The arbor creates a dome-like structure in which roses of a variety of colors grow on, providing shade inside the dome, making it a perfect place to relax and hang-out in. This is a traditional arbor made of lightweight maple wood, perfect for small gardens/yards and lightweight vines. The natural wood color of the maple adds a touch of warmth to any area of your garden while still blending into the natural surroundings. This type of ready-made arbor is cheap, easy to assemble and to move around. Rustic wood arbor with rose vines and lattice fence. 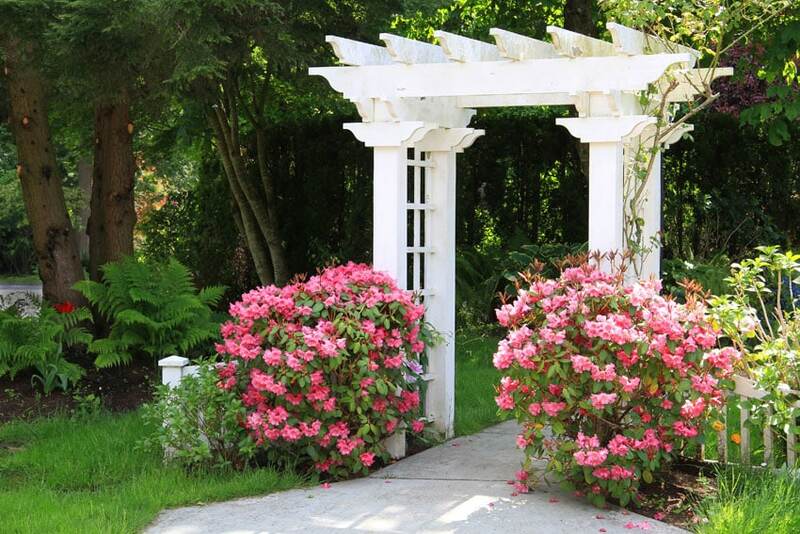 This type of arbor looks great for the entrances of a garden and can be adorned with a variety of flowers. 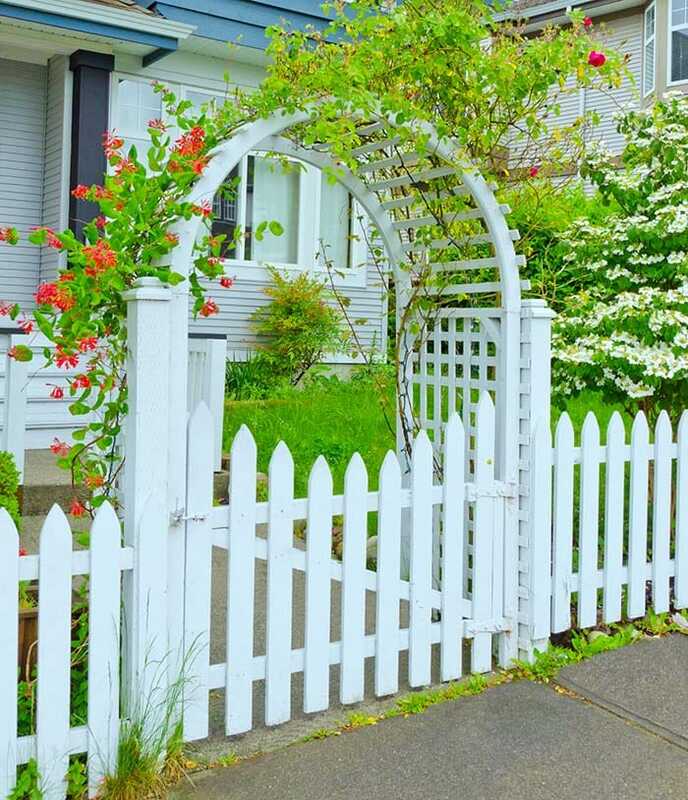 An attractive curved arbor with lattice design with gate connected to a white picket fence. 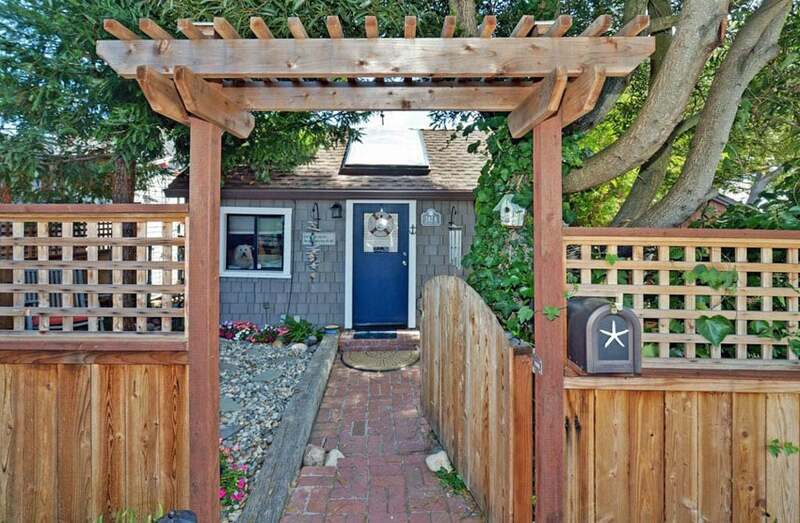 A wood arbor with gate creates an appealing design for the entryway to this house’s front yard. 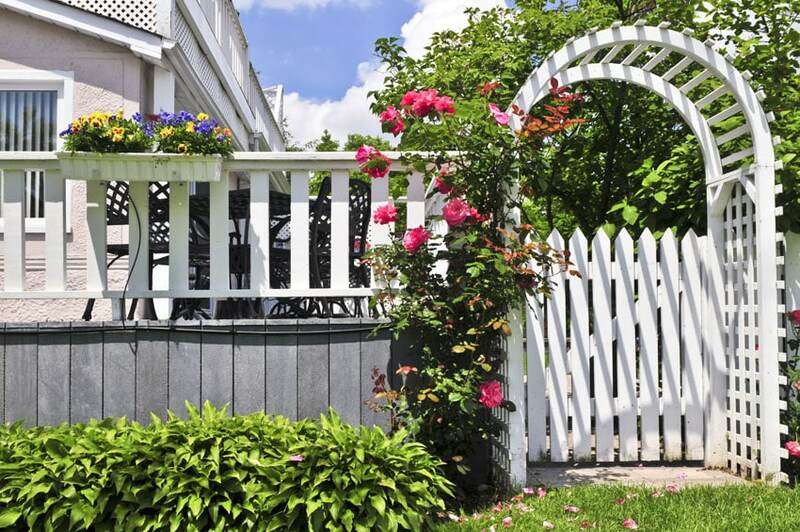 The wood lattice fence helps provide privacy and separate the yard area from public spaces. 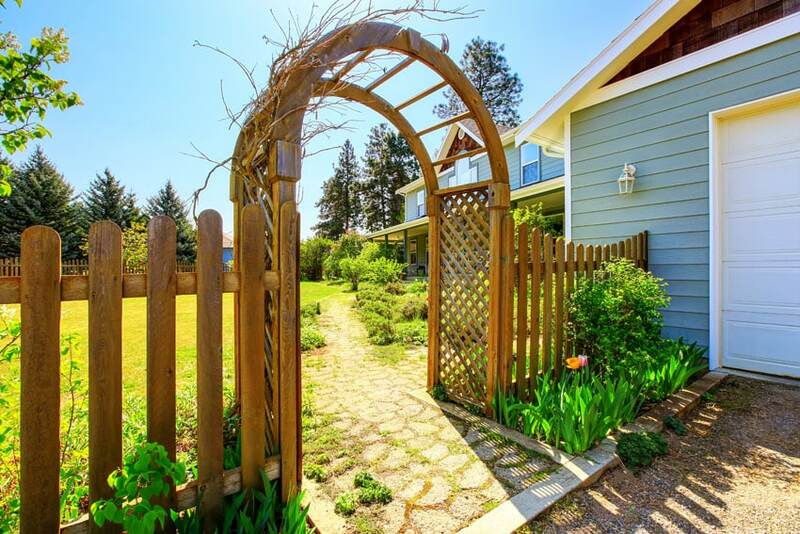 This wood arbor features a picket fence and attached lattice creating a cozy entrance pathway to the home’s front door. 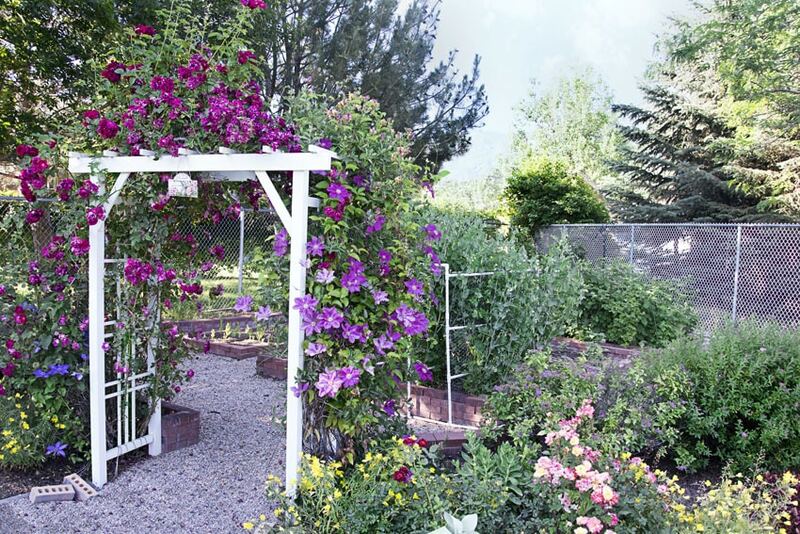 A garden arbor is the perfect addition to a backyard as they provide several different uses. An arbor can become can provide a shady spot to sit and relax and enjoy your garden space. It can be used to provide privacy, or partition off a portion of the garden. In addition, it can be the ideal framework for beautiful flowering plants. 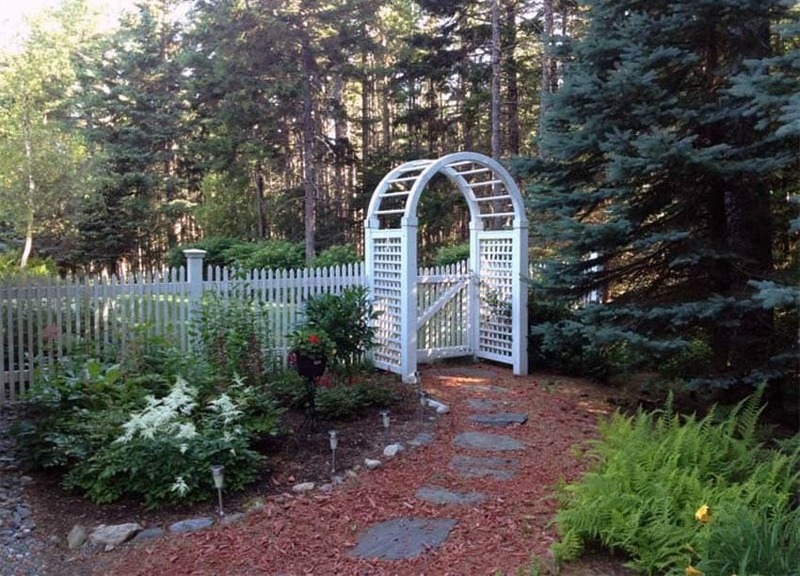 One could create a tunnel like structure to form a lovely arbor pathway through their garden. A series of traditional arbors which creates a tunnel for the walkway. It stands on concrete Tuscan columns and uses solid wood beams to create a simple series of arbors. Metal wires were wrung around the columns to help the rose vines climb. A small archway arbor made of lightweight vinyl can easily be placed in any part of your garden as an accent piece or a subtle archway to help separate different areas of the garden visually. This simple yet sturdy arbor can easily be assembled and transported, and is also an ideal size for smaller gardens. 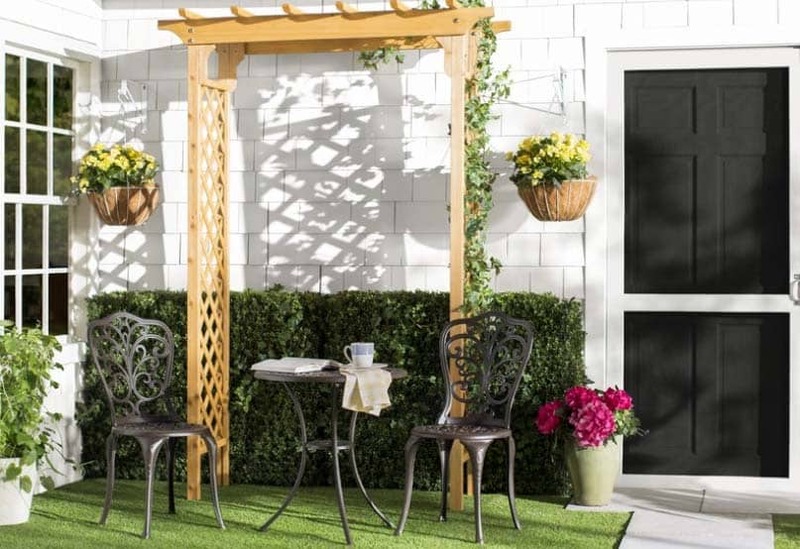 This traditional style arbor is made from powder-coated aluminum, making it lightweight, durable and weather-resistant. It was placed by the entrance to another area of the garden, and is covered in a variety of flowering vines in different colors and shapes, making it easily visible from afar. Using the original structure of an old shed with weathered thatched roofing, this simple rustic traditional arbor was produced. 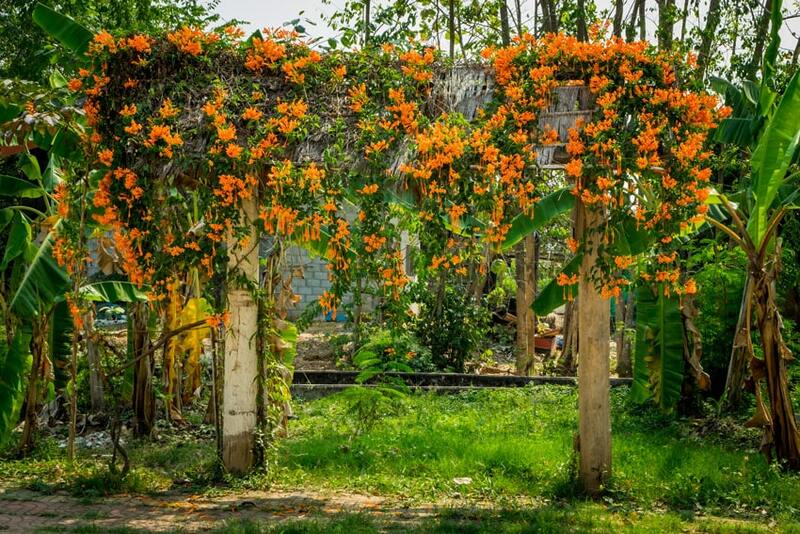 Cross vines grow abundantly on its beam, adding a bright orange color to the arbor which makes it stand-out from the mostly green surroundings. This traditional arbor uses large, sturdy wood supports for both its base and beams, making it a really solidly-built arbor. This was conveniently placed along a pathway, creating a marker/entrance area. 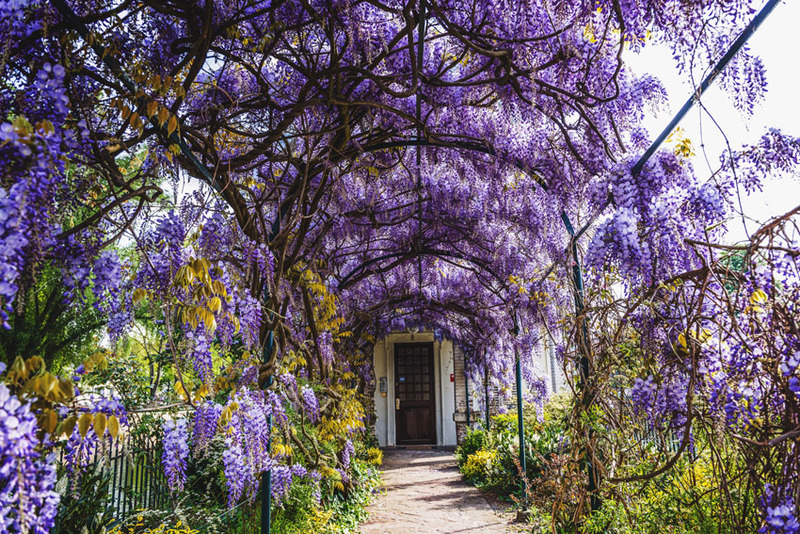 Wisteria grows in abundance in this metal archway arbor, creating a gorgeous and shady tunnel leading towards the entrance of the house. When in full bloom, this archway arbor definitely gives a stunning and lasting impression to anyone who passes beneath it. A simple ready-made metal arbor with curvy plant motifs on the side to serve as the foundation for the crawling vines. The teal paint of the arbor helps it blend in with the other elements of the garden, easily making it virtually invisible especially once the leafy vines on it completely grows. In this you will see a pair of traditional style metal arbors. 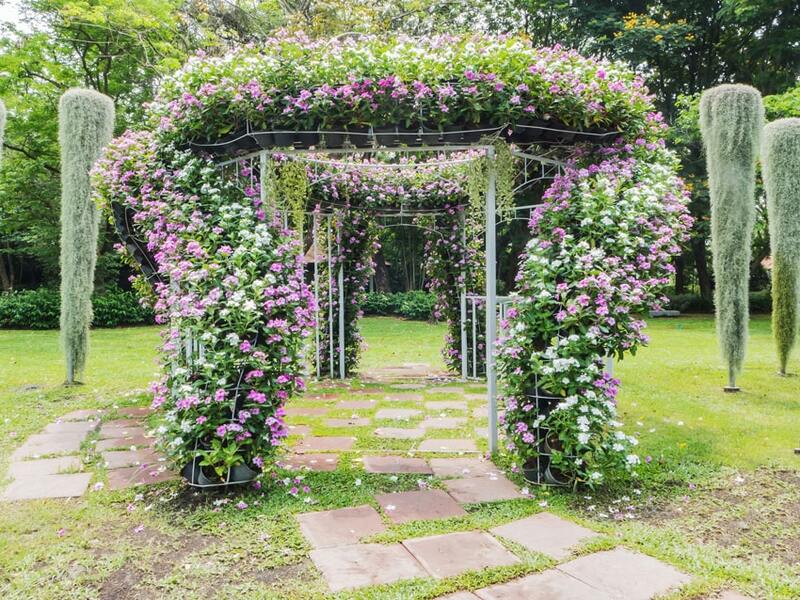 Instead of the usual crawling plants or vines, it instead uses normal flowering plants to surround the arbor by creating a built-in structure to hold multiple flower pots on the sides and on top of the arbor.